Finally back in the routine of things and in 12 hours, I will be back out of it for the weekend again. I'm going back up to Penn State to care for the injured reserve. Last time I was ambitious and brought homemade brownies... this time, not so much. I got home late on Tuesday night, had from 7:30-11:00 p.m. to get all my things together Wednesday, and now its bright and early Thursday morning... a few hours away from when I leave again. So it's safe to say things are hectic but that's the way I always live my life, so be it. The one thing about going home is that I have my normal food selections again. This isn't to say I didn't just loveee paninis and mini wheat's every day, but it's nice to be in a system. 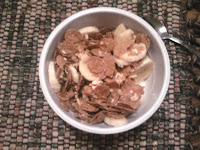 Breakfast was Fiber One Honey Clusters with 1/2 a banana and 1% milk. The problem with that meal, and don't get me wrong, I love it, is that there is little fat to keep hunger away. So even though I eat around 8:00 a.m., I'm quite hungry before 11:00. I'm going to have to amp that up a little. So I sat through nutrition hungry for an hour and then left to work out. I took the whole weekend off other than a lot of walking and the one "run" up to my car. Sometimes a body just needs a break and obviously, my health wasn't of concern last weekend. Unfortunately, it will probably be the same case this weekend. Maybe I can get something light in. Hopefully. I'm just like my mom; she gets antsy anytime she can't work out. As long as I do something, it's okay. Although it's totally mental and I can admit that, I just feel better about the rest of my day's choices if I've worked out. I did the elliptical for 43 minutes. I aimed to burn about 600 calories (or thereabouts). I tried to see if not listening to music on a machine was as beneficial as it was while running outdoors-- I DO NOT RECOMMEND THIS! I did some ab work also, but knowing full well I'll get a good ab work out in today (Thursday) I didn't push too too hard. After the gym I had to go home, eat, shower, and pack up stuff for work. I made another chicken pita. This one had 1/4 an avocado, sliced chicken breast, sour cream, and taco seasoning. Our lettuce looked less than appetizing so I steered clear of it. 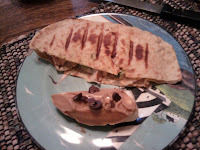 I also had the other 1/2 banana with half a tablespoon of peanut butter and a couple chocolate chips. This meal has a lot of fat, but a huge majority of it is mono or polyunsaturated fats. Notice, unsaturated. Saturated fat is what leads to high cholesterol, heart problems, and all of those fun things. I convinced Alex to switch from whole to 2%... what an accomplishment! Seriously though, it's got 5 grams of saturated fat. 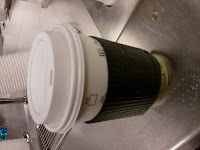 That is 25% of your daily intake in just one cup. So steer clear of it, other than occasionally for cooking. Fortunately, when you do enjoy your saturated fat filled treats, it can be balanced by healthy unsaturated fats: nuts, seeds, avocado, olive oils, etc. Speaking of almonds, obviously had those for a snack, alongside a cup of coffee from "Starbucks" aka the cafeteria at work. Dinner was impressive last night. Well, it looked really healthy, at least. We were supposed to grill but it was pouring and cold, so Susie sauteed the chicken in a little bit of olive oil. We've had this chicken before and it's much better on the grill, but it still did the trick. 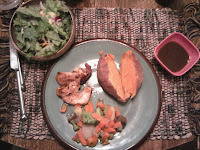 Susie also served a sweet potato (much better than white!) and some frozen veggies. We were also going to grill veggies but again, no thanks to the rain, we were stuck defrosting some instead. Also had a salad...I'm biased, but I think I make them better than Susie. Over all this is a pretty well balanced meal. This is before I had my sweet tooth craving, and caved as usual. They say it takes 28 days to kick a bad habit... I don't even want to go down that road but I almost feel addicted to sweets and treats after dinner. 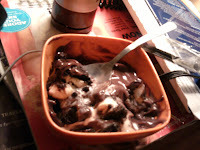 It's fine to have a few pieces of chocolate, or a half cup of ice cream, but I tend to go overboard, a lot. It's my one major diet pitfall. I try not to feel bad about it but after it's over I wonder why I just HAD to have the fairly lackluster pudding cup.